Foreign publishers or agents interested in licencing any Sybertooth titles for translation are invited to contact us regarding translation rights at the address above. Please include details of your company, the title of interest, the language and country of translation, and anticipated print run. "This collection of nine short stories is a true jaw-dropping jewel of a book..."
"Paul Marlowe has once again written a fine story, but this time he has done it nine times over... 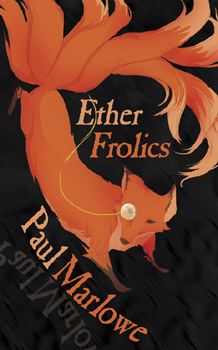 I highly recommend Ether Frolics. It is such fine storytelling, you will be so enthralled your tea will go cold!" A collection of nine steampunk stories drawn from the archives of the Etheric Explorers Club, a Victorian society dedicated to exploring the mysteries of the etheric realm... The visions of a Russian painter in fin-de-siècle Paris... a terrible weapon that almost no-one has survived... a confession within a confession... a crime from antiquity resurfacing beneath the Thames... a desperate search for a lost sister... a contemporary horror entwined with an ancient manuscript... an experiment gone wrong... a lost world which should have remained lost... and a night of dining, death, and romance. Text & Graphics © 2012 Sybertooth Inc.